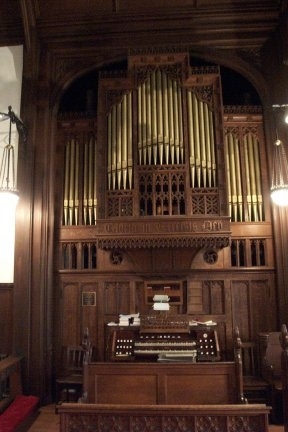 The parish's fine organ was built by the Methuen Organ Company in 1905. The factory of the Methuen Organ Company was located on the grounds of the Methuen Memorial Music Hall, where the parking lot presently exists. At least partially financed by Edward Searles, the company was run by James Treat. Meticulous craftsmanship using the finest materials is the hallmark of Methuen Organ Company's instruments. The organ in St. Andrew's has 2 manuals and 23 stops, with tracker-pneumatic action. Its case is unusually handsome, featuring carved quarter sawn white oak and case pipes of polished tin. Couplers Reversible Gr. to Ped. The manual key action is tracker, the stop and pedal actions are tubular-pneumatic, and the chests are ventil. The building and organ were given to the parish (then named All Saints) by Edward F. Searles.